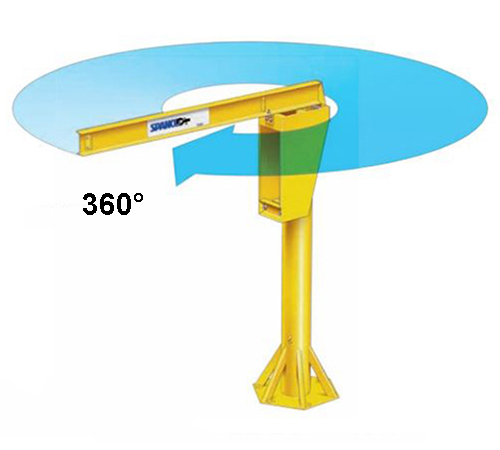 A full 360 degree rotation allows greater work space and materials transfer flexibility. Hexagonal base plate with six knee braces is anchored to required, reinforced concrete foundation which also acts as counterweight for load. Head assembly allows bottom entry electrical wiring or top entry to the boom. 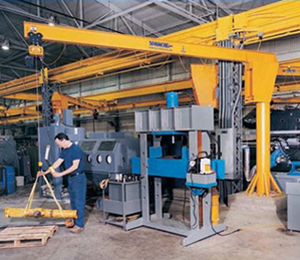 Capacity is the weight that the boom arm can support. The total weight of the load, trolley, and hoist should never exceed this number. 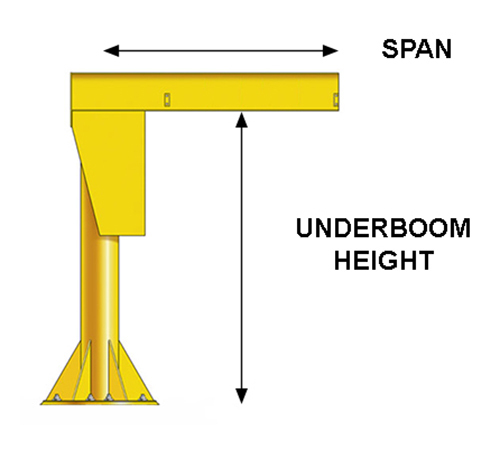 Span is the distance from the center of the mast to the end of the boom arm. Actual working span along which loads can be moved will be lower than this measurement. Underboom Height is the distance from the floor to the bottom of the boom. Keep in mind the height of the hoist when determining how much underboom clearance is needed for your application. The span of the boom arm and the underboom height are key measurements when selecting the right jib crane for your space and applications. Full 360 degree rotation of the boom provides a large work area for flexibility when lifting, positioning, and transferring loads. 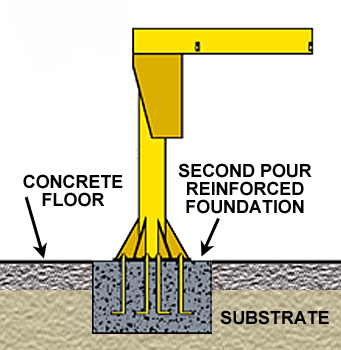 Base Plate Mounting: The crane is anchored to a large second pour reinforced foundation that has anchor bolts embedded in it at the time of the pour. Anchoring is done through a base plate using the anchor bolts embedded in the foundation. The foundation must be large enough to properly counterbalance the full weight of the crane plus maximum load capacity. Typical foundation sizes range from 3 ft. deep by 4 ft. square to 5 ft. deep by 11 ft. square.